The Trump administration, or a powerful military-intelligence faction within it, is pushing for a pre-emptive military strike on North Korea, in the wake of, or possibly even during, the Winter Olympics due to start in South Korea on Friday. 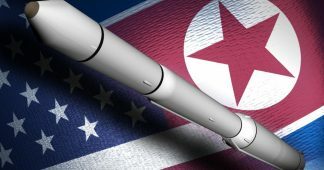 The “bloody nose” option—a limited attack on the North Korean nuclear missile arsenal and infrastructure—is supposed to overawe the Pyongyang regime and bully it into surrendering to Washington’s demands to denuclearise. Unprovoked US aggression, however, would almost certainly trigger retaliation, rather than submission, with incalculable consequences. 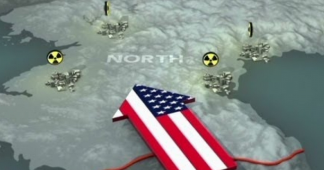 Even if nuclear weapons were not immediately used, the death toll in South Korea alone is estimated in the tens of thousands on the first day, in a conflict that could rapidly draw in nuclear-armed powers such as China and Russia. Yet, such an act of recklessness and savagery is precisely what is being discussed, debated and prepared in the upper echelons of the White House and the US security-intelligence apparatus. Within top military-foreign policy circles, the advanced nature of the plans is so well known that it is generating fears and opposition. 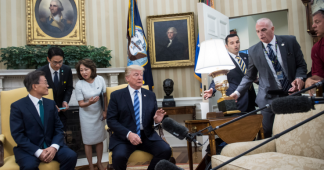 Last week, the Trump administration abruptly dumped its appointee for US ambassador to South Korea, Victor Cha, after he voiced opposition to a pre-emptive strike on North Korea. Cha subsequently went public, penning a comment in the Washington Post in which he warned that a US attack would put 230,000 Americans in South Korea at risk—equivalent to a medium-sized city like Pittsburgh or Cincinnati. The Democrats’ letter, far from expressing genuine opposition to war, is part of the intense debate raging within the US political establishment over whether Russia or China represents the greater immediate danger. The escalating campaign against Trump over alleged collusion with Russia during the 2016 presidential race is aimed at placing Moscow first in the cross-hairs, rather than North Korea and China. The bitter political infighting over foreign policy is compounding the instability of the Trump administration, which is confronting a worsening economic crisis, share market volatility and mounting working class resistance to deteriorating living standards. 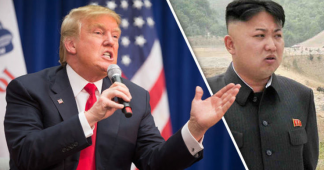 Far from this making war less likely, Trump could launch a military attack on North Korea in a desperate attempt to turn these acute political and social tensions outward against an external enemy. Following the Olympics, the US and South Korea will proceed with massive joint war games known as Foal Eagle and Key Resolve, which were temporarily delayed. 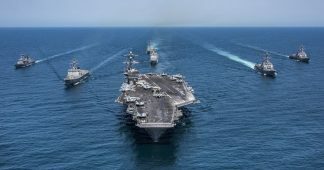 Last year’s exercises involved more than 300,000 troops, along with a substantial naval presence and the most advanced American warplanes, in a thinly disguised rehearsal for war with North Korea. 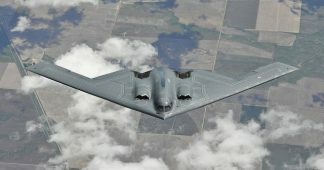 The Pentagon also recently stationed nuclear-capable B-52 and B-2 strategic bombers on Guam within easy striking distance of the Korean Peninsula. As Victor Cha hinted in his Washington Post comment, a “bloody nose” strike is not the only military option under consideration. “There is a forceful military option available that can address the [North Korean] threat without escalating into a war that would likely kill tens, if not hundreds, of thousands of Americans,” he wrote. The only military alternative to a limited attack is an all-out assault with nuclear and/or conventional weapons that would obliterate North Korea’s capacity to retaliate. The danger that a mistake or miscalculation could lead to Trump ordering the “total destruction” of North Korea is underscored by last month’s false alarm on Hawaii of an incoming nuclear missile. Moreover, US imperialism has a long history of concocting events to justify war—such as the 1964 Gulf of Tonkin incident that was used as the pretext for direct American military intervention in Vietnam. Any pre-emptive US military strike on North Korea would send shock waves around the world and provoke an outpouring of anti-war sentiment. But opposition to war, which is already widespread, must be galvanised into a unified movement of the international working class on the basis of a socialist program directed against the root cause of war—the capitalist system.